Shavleg Shilakadze (b.21.02.1940,Tbilisi), Georgian composer and conductor, Professor, Artistic director of the Chamber orchestra “Concertino Tbilissi”. Conducting faculty (Prof. O. Dimitriadi) and Graduated Leningrad (Sankt-Petersburg) N. Rimsky-Korsakov Conservatoire (Prof. N.S.Rabinovich, Prof. A.S. Dmitriev). In 1959-1969 he played viola in the Georgian State Symphony and Chamber Orchestras. 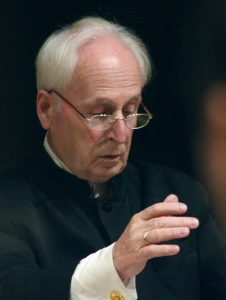 He made his debut as composer in 1959, and as a conductor in 1967. Philharmonic Chamber orchestra, 1976-77 he worked as head of the Chamber Music Department of Georgian State Philharmonic Society. centers of the former USSR. Switzerland and in Great Britain. at Murcia International Festival of Young Orchestras, successfully collaborated with the Cairo Chamber orchestra “Amadeus”. concertos, 4 string quartets, chamber and vocal music, music for choir etc. international arts scholarships in Germany and Switzerland (2004-2005, 2007, 2009, 2010, 2011, 2012, 2015, 2016, 2017).